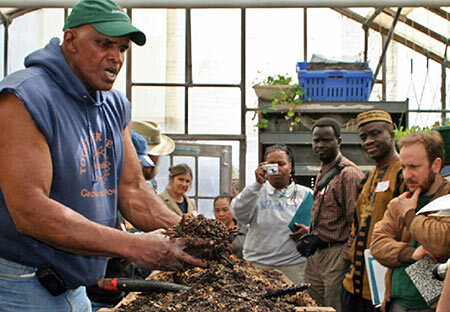 Will Allen of Growing Power teaches a small group about good compost, which produces more nutritious and abundant crops. The Helen Bader Institute for Nonprofit Management works to enhance organizational efficiency and effectiveness in the Greater Milwaukee area through community initiatives and organizational capacity building projects. These projects provide technical assistance and other management support and information services to local nonprofit organizations, and increase public awareness of the importance of effective nonprofit management and leadership. The nonprofIT program is a part the School of Information Studies (SOIS) at the University of Wisconsin Milwaukee. The program provides non-profit organizations in the Milwaukee area with Information Technology support they would otherwise be unable to get. In return UWM students gain real world experience working on teams and projects to provide technology solutions while developing a passion for service. HBI periodically convenes “Forums on the Nonprofit Sector” to promote greater understanding of national issues that affect the nonprofit sector. The Forums encourage dialogue among diverse stakeholders on important nonprofit issues, leading toward greater understanding and more productive partnerships to address community challenges. Opportunities to engage in forums are advertised through the Nonprofit Portal or through direct invitation from HBI.